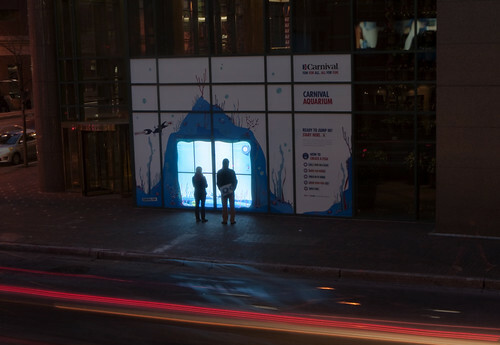 The interactive aquarium is installed in store front windows in 6 cities across the US. Using computer vision the seascape will react to the motion of a user, seaweed will sway and fish will scatter. 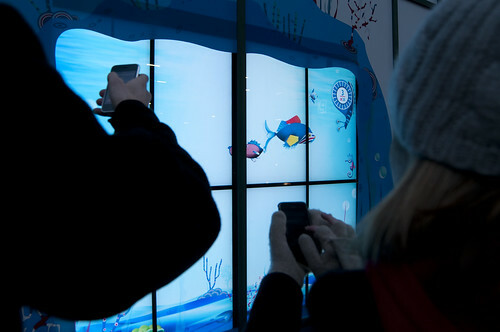 Users can then dial in with any mobile device and create a fish using their voice. As they connect in realtime the sounds they make are analyzed and create a dynamically generated fish. You can then enter that fish into the aquarium and use your key pad to eat various pieces of fish food that will transform and morph your fish into creatures. The application will remember the state of your fish so that when you call back later you can evolve your fish even further.